The Subrahmanyan Chandrasekhar Memorial Fellowship, supported through a gift from Mrs. Lalitha Chandrasekhar, was first awarded at the University of Chicago in the year 2000. Each year, a new Fellowship will be awarded to an outstanding applicant to graduate school in the Ph.D. programs of the Department of Physics or the Department of Astronomy and Astrophysics. Preferential consideration for the Fellowships will be given to applicants from India. 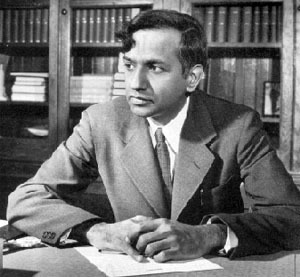 Subrahmanyan Chandrasekhar was an Indian-born physicist and astrophysicist who served on the faculty at the University of Chicago from 1937 until his death in 1995. His wide-ranging work included fundamental contributions to the fields of general relativity, stellar structure, stellar dynamics, radiative transfer, plasma physics, and the history of science. He was awarded the Nobel Prize in 1983 for his work on the structure and evolution of stars. NASA has named its X-ray observatory satellite 'Chandra' in his honor. The term of the Fellowship is two years. During this period, the Fellowship will cover tuition expenses in full, and will pay a stipend above the rate normally paid to teaching assistants and research assistants. Chandrasekhar Fellows will be required to serve as teaching assistants for a total of two quarters during the two-year term, but otherwise will have no teaching or research duties associated with the Fellowship. It is expected that one Fellowship will be awarded each year. Information for Prospective Physics Ph.D. Students.